This post is just a silly smoothie recipe but it feels like a party to me. The Worst Writers Block of 2015 has officially been broken! The few things I actually did write during The Worst Writers Block of 2015 were so terribly bad that it sent me into some sort of writing depression. I go through this a lot, so don’t worry about me too much. And 3) to provide you all (and Kari!) with a most delicious concoction I created recently, that was too good not to share. So with that long-winded intro…. Time to smoothie and celebrate the end of yet another WRITER’S BLOCK! If you don’t have a high powered blender it is helpful to soak your dates in a little hot water to soften them before blending. Also, try blending just the greens and liquid first, then add your remaining ingredients. 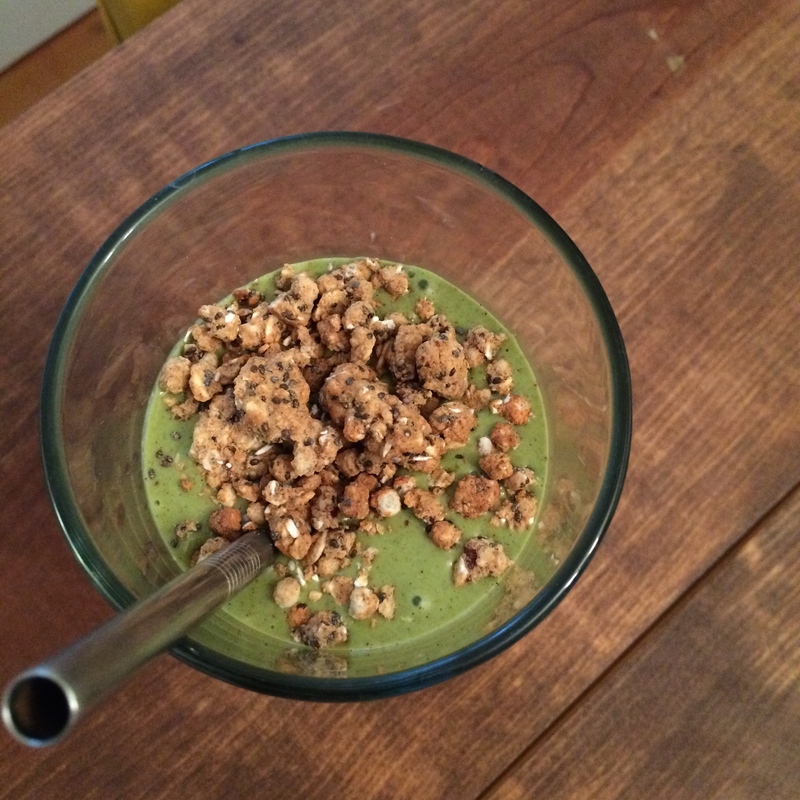 I find that the “baby” greens blend best in regular blenders. PRO-TIP: eat the smoothie soaked granola with the spoon at the end of your smoothie experience for the most delicious bite of Mamma Chia granola you have ever tasted. Blend your greens & be good to yourself. A 6 months writer’s block? C’ mon, it was just a blog block. Did you ever consider that it was “The Wind Up Bird Chronicle” that caused it? Now you’re finished and you can continue with your literary life. Next, try “Euphoria” by Lily King for some anthropological fun in the field. Hope to hear more from you soon! I missed you.